Salt Pls. : Sophia's 1st Birthday Cupcakes!! I can't believe my daughter is already 1!!! And i am just so glad that i made the birthday cupcakes myself instead of ordering them. This was something i really wanted to do. So much more meaningful and everyone loved them. Soft and moist with a burst of lemon and you bite into them. They were Lemon cupcakes filled with Lemon curd. Makes me want to have one right now as I'm writing up this blog. I decided to go with the bright colors since it was a garden themed party. So we had Aqua, Yellow and Rose Pink frosting for the cupcakes. 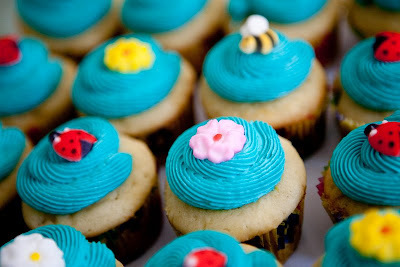 I also ordered some sugar toppers to decorate the cupcakes so that they went with the theme. Something so simple, yet elegant. Here's the recipe for the cupcakes and Lemon curd. For the butter cream frosting, i used 1/2 stick of softened butter to 2 1/2 cups of powdered sugar and vanilla extract, and little bit of milk as needed for the consistency. Enjoy!! 1. Preheat the oven to 350 degree F. Line thirty 2 1/2-inch muffin cups with paper bake cups; set aside. In a medium bowl, combine flour, baking powder, baking soda, and salt; set aside. 2. In a large bowl, beat butter with an electric mixer on medium to high speed for 30 seconds. Add granulated sugar and vanilla; beat until well mixed. Add eggs, one at a time, beating well after each addition. Add flour mixture and sour cream alternately to beaten mixture, beating on low speed after each addition just until combined. (The batter will be thick.) Stir in lemon peel. 3. Spoon about 1/4 cup of the batter into each prepared muffin cup. * Bake in the preheated oven about 18 minutes or until a wooden toothpick inserted in centers comes out clean. Cool completely on a wire rack. Makes 30 cupcakes. In a medium bowl, lightly beat egg. Whisking constantly (or with an electric mixer on low), very slowly stream the hot lemon-sugar syrup into the egg. Beat for 2 minutes (only 1 if you’re using a mixer), then transfer back into the saucepan by pouring the mixture through a sieve. Transfer to a small airtight container and store in the fridge.